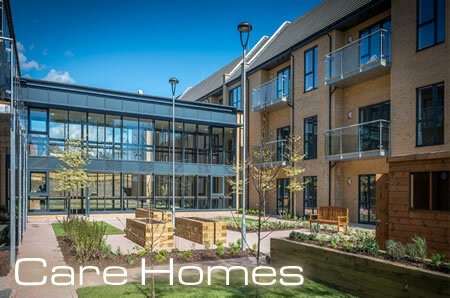 Triangle Fire Sprinkler Systems specialise in the design, supply and installation of BS9251 automatic fire suppression systems in residential care homes. These can be installed in new build or existing homes. Operators of residential care homes are responsible for ensuring compliance of the Regulatory Reform (Fire Safety) Order 2005. This is a legal requirement and puts the onus on operators to ensure that a risk assessment is carried out and measures are taken to reduce the risk of fire to ensure the safety of residents in the event of fire. Guidance published by the National Association for Safety and Health in Care Services (NASHiCS) and the Chief Officer’s Association (CFOA) is designed to deal with various issues regarding Fire Safety. These include evacuation times, requirement for rooms where residents are unable to evacuate, staffing levels, fire escapes, travel distances etc. The key responsibilities and duty of care is to ensure the safety of occupants, staff are trained in fire awareness, reduction in fire safety risks and evacuation procedures. The Order states that the risks should be reduced when reasonably and practically possible. Care home operators must take measures to ensure the safety of residents in the event of fire. Each year in the UK there are between 800-900 fires in premises providing care for older persons. On average 5 people die each year as a result of fire and a further 90 injured. Residents cannot get out when the fire alarm sounds or will have difficulty in doing so. It takes two members of staff to lift one person and a fire can reach fatal conditions before the Fire Brigade arrive. It could take months before a fire damaged care home is operational again. Potential reduction in night staff (calculate this over an example 25 year period). Reduction in level of fire protection both structural and compartmental. Reduction in number of smoke lobbies and doors. Enabling two residents to reside in a single room. Door closures not required on bedroom doors. Have peace of mind that the risk of fire has been virtually eliminated. Have provided the ultimate in fire safety for your current residents and those for the next 50 plus years. Have fully complied with the requirements of the Regulatory Reform (Fire Safety) Order. See our care home case studies and contact us for free advice, site visit or quotation.